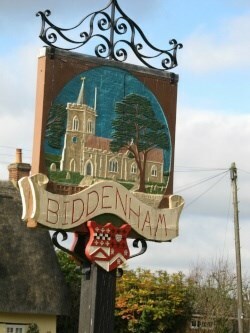 A Village Sign (newly replaced) at Biddenham in Bedfordshire. You are looking for a 50 ml pot. Biddenham is one of the smallest and one of the prettiest villages in Bedfordshire. It lies in a loop of the River Great Ouse before it reaches Bedford some two miles away. It is worth while visiting the village pond created in 1700 by Sir William Boteler and his wife Elizabeth as a carp pond to provide fish for the Biddenham Manor table. This was restored in 1986 and is maintained as a wild life and amenity area for the village by the Friends of the Biddenham Village Pond . The pond lies on an ancient causeway, the Coffin Path, leading from the village green in Gold Lane, past the pond, to the church. There are benches available for your well deserved rest and enjoyment.